The battle to halt the devastating blaze at Notre-Dame cathedral in Paris evoked memories of the fire that took hold in York Minster 35 years ago. Millions of euros have been pledged to help rebuild Notre-Dame after Monday's fire destroyed much of the 850-year-old Gothic building. 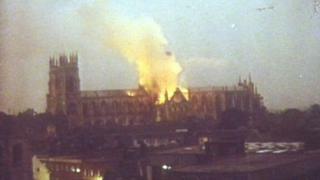 In the early hours of 9 July 1984, lightning set fire to York Minster's south transept causing £2.25m damage. Experts at York said restoring Notre-Dame was "quite achievable". John David, a master mason at York Minster, said Notre-Dame could be rebuilt using traditional crafts. Mr David, who was working at the Minster in 1984 and dealt with the reconstruction after that fire, said work to repair the building may take time, but it would be done properly. He said the two churches faced the same dilemma on reconstruction. Mr David said: "At York Minster there were questions about whether we put an oak roof back on top or a steel roof or even a concrete roof. "Some people think we can't do this sort of thing any more in traditional materials - we can, and so I think the roof will be reconstructed and put back on. "I don't think it will take 10 years - it might take two years to decide what to do, but it's quite achievable." Archbishop of York Dr John Sentamu tweeted to say he was offering prayers after the fire at Notre-Dame. Alan Stowe, who was the divisional fire commander at the time of the Minster blaze, said the scale of the fire may have differed but the TV pictures reminded him of the night he was called to the centre of York. He said: "It certainly brought back very, very vivid memories of the 9 July 1984 with the sky lit by the flames leaping from the structure of that building. "A building that, like York Minster, that's so loved, so important, so well known internationally and containing so many valuable artefacts." Mr Stowe added: "The picture that I saw was very similar to the one that confronted me as I approached the blaze at York Minster where there were so many things to be considered including difficulty of access. "Dealing with the fire was a tremendous responsibility, a tremendous challenge, not only in minimising the damage caused by the fire." The Dean of York, Jonathan Frost, said in a tweet his thoughts were with the people of Paris. Selby Abbey, just over 14 miles from York, was also badly damaged in a fire - in 1906. The abbey posted a tweet in support of Notre-Dame. The Very Reverend John Dobson, the Dean of Ripon Cathedral, also in North Yorkshire, said: "Our hearts go out to the people of Notre Dame and Paris as this tragedy grips them in Holy Week. We pray for them and all who are working to bring the fire under control."